The North Caroliniana Society, due to their commitment to support our state’s K-12 teachers, partnered with Carolina K-12, a program of Carolina Public Humanities at UNC-Chapel Hill, to develop the William Friday Teacher Education Initiative. The goal of the initiative’s programs and offerings are to equally educate, appreciate and affirm North Carolina’s hardworking educators as the impactful and important professionals they are. The Friday Initiative sponsors free, high quality retreats and other professional development programs, as well as supports the development of ready to use curriculum for the K-12 classroom. These five Retreats have served 161 teachers from 71 of North Carolina’s counties, who will in turn reach 22,540 students all around the state. For information about upcoming Friday Retreats, which are hosted twice each year in various locations across North Carolina, visit Carolina K-12’s Upcoming Trainings page or contact Christie Norris at cnorris@unc.edu. 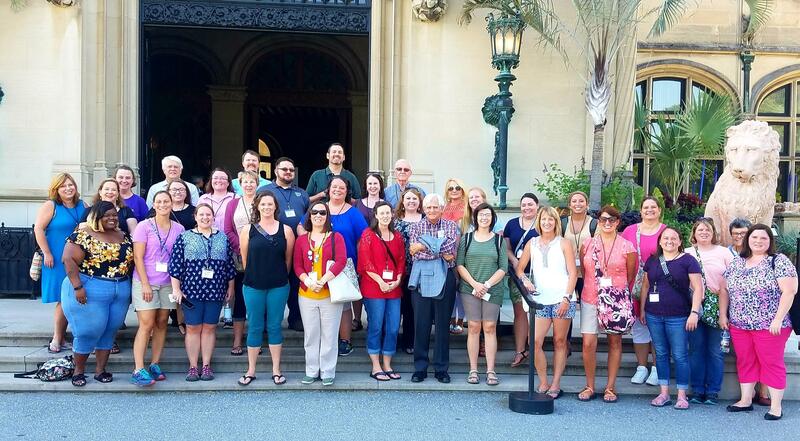 Funding from the North Caroliniana Society makes the Friday Teachers Retreats possible by covering preparation of pedagogical materials, compensation for staff time for the development and facilitation of the programs, stipends for speakers (professors, authors, performers, etc. ), teacher lodging and transportation costs, food for participants, and other costs that ensure any North Carolina teacher can experience a quality, educational and inspirational experience without having to reach into their own pocket. “Thank you for this truly exceptional opportunity. I attend a great deal of professional development and I am so impressed, moved and honored by these 3 days. I have never attended any staff development where I was among scholars of this level and award winning, publishing eminence…these 3 days far outshined other PDs. It is immeasurable being among scholars like this. I feel uplifted, validated, worthy, inspired, awestruck, and hopeful. I feel like I matter again. My students struggle to connect with the facts, dates, locations and information of history. These faces, voices, stories, & perspectives of history all help so much. Middle School is a difficult time and age. The students are trapped in limited thinking based on their own and their parents’ often limited exposure. Encouraging children to think for themselves can meet with resistance from parents. These resources are priceless to combat this. We feel deflated and beaten up much of the time. There’s so much love and appreciation here. I will carry this time forward and fondly. 10,000% above and beyond other PD. Thank you all from the bottom of my heart. It was all so special and so needed. My hurt heart is healed by being here. Thank you for the North Caroliniana Society’s recent gift to Carolina K-12 Fund in the Carolina Public Humanities, supporting the 2017 William Friday Teachers Retreats in Chapel Hill and Edenton. Your gift helps us offer seminars to K-12 educators from across North Carolina celebrating the diverse history and heritage of our state, who then take their experiences back home to their students and classrooms. Your generosity helps host these events and assist our participants with travel and hotel expenses. I am excited to see what the future holds because I am certain the best is yet to come. The North Caroliniana society, Inc.
©2018 The North Caroliniana Society, Inc.